There are a variety of types of cedar trees, from eastern red cedar to western red cedar, all of which can be identified once you know how. The eastern red cedar, a juniper, is common among wide swaths of the United States plains and east coast, with alternate leaves and double toothed. The western red cedar, also known as the giant cedar, is common in the western United States and has green foliage sprays is small scale-like leaves. If you’re not an expert on trees (and maybe even if you are) you might be confused about the difference between two trees both called Red Cedars. There is an Eastern Red Cedar and a Western Red Cedar, but can you identify each one individually? How does one tell them apart, and what are their differences? Let’s take a close look at the two types of trees to see all the ways in which they differ and can be discerned from one another. The Western Red Cedar or Pacific Red Cedar is an evergreen that belongs to the genus Thuja. It is technically not a true Cedar, that is a member of the genus Cedrus. As the name implies, it can be found primarily in the Pacific Northwest of the United States. It prefers to grow in lower elevations, but it can be found from sea level to approximately 7500 feet (2290 m) above sea level. Though the Western Red Cedar is native to the Pacific Northwest, it has been imported to other temperate climates like parts of Western Europe, New Zealand, Australia, and parts of the North East United States. It doesn’t require much sunlight to grow, and as such, it is capable of thriving even in conditions of dense shade. The Western Red Cedar is quite large, typically ranging from between 210 to 230 feet tall (65 meters to 70 meters), and 10 to 13 feet (3 meters to 4 meters) in diameter. The trees are capable of living a long time, with some specimens thought to be over 1400 years old. The leaves that grow in the Western Red Cedar are notable for the fact that they grow in opposite pairs, at 90° to one another. This gives the foliage sprays of the tree a flat lattice-like structure. The foliage also has white stomatal bands on the underside of the leaves, and when they are crushed they emit a strong smell similar to pineapple. The cones which are dropped from the tree are approximately a half-inch around and have a reddish-brown hue, much like the bark of the tree itself. The cones release between 2 to 3 seeds near the end of the summer season. The bark of the tree has a reddish-brown color, and it has vertical ridges that run up and down the entire length of the tree. Lumber that is derived from the Western Red Cedar has a light reddish-tinge to it. It gives off a distinctive aroma, and because of its hearty nature (it doesn’t rot or bend easily), it is frequently used to construct a variety of wood structures like decks and siding for houses. The Eastern Red Cedar, sometimes known as the Eastern Juniper, is actually a species of Juniper found along the eastern coast of North America into southeastern Canada and down to the Gulf of Mexico. There are actually two subspecies of Eastern Red Cedar, the Juniperus virginiana var virginiana, which can be found throughout the eastern US from Maine to Florida and the Juniperus virginiana var silicicola, which is found mainly throughout Florida, the south-east coast of the US, and parts of Texas. The Eastern Red Cedar is much shorter overall than the Western Red Cedar, typically being between 16 to 66 feet tall (5 to 20 m) with a trunk between 12 to 39 inches (30 to 100 cm) in diameter. The Western Red Cedar is also quite long-lived, with some members of the species living more than 900 years. The Eastern Red Cedar grows juniper berries which are a source of food in the winter for various birds. The leaves of the Eastern Red Cedar are short and needle-like. As it grows the leaves becomes like scales, covering the noticeably thin twigs of the tree. Though Eastern Red Cedars usually resemble shrubs more than trees when they are young, as they mature they gain new growths at the end of their branches. The male Eastern Red Cedars have flowers which can be seen during late winter and the early parts of the spring. By contrast, the females of the species have small Juniper fruits, which have a pale blue coloration to them. The bark of an Eastern Red Cedar is quite thin, so thin that it is frequently stripping off the tree in tiny, thin chunks. The inner bark of the tree is a bright orange color, while the outer bark of the tree is a light brown. The Western Red Cedar or Eastern Juniper is capable of living in a variety of habitats, in forests, prairies, pastures, or even limestone hills. It is a pioneer species, which means that it is one of the first species to move into damaged areas of land. The wood of the Eastern Red Cedar has a brownish red coloration to it and is known for being very durable despite the fact that it is quite light. It does not rot easily, which makes it ideal for the creation of chests, closets, and fence posts. Some true cedar plants, those of the genus Cedrus, are typically only found in the Mediterranean or in curated environments in the US. These trees include the Atlas cedar and the Deodar Cedar. Yet there are “New World Cedars” that can be found in North America. These cedars are part of the Cupressaceae, or cypress family. The distinguishing features of these New World Cedars are sprays that are flat and fan-like. They usually have tiny flowers or small cones attached to the sprays of the tree. 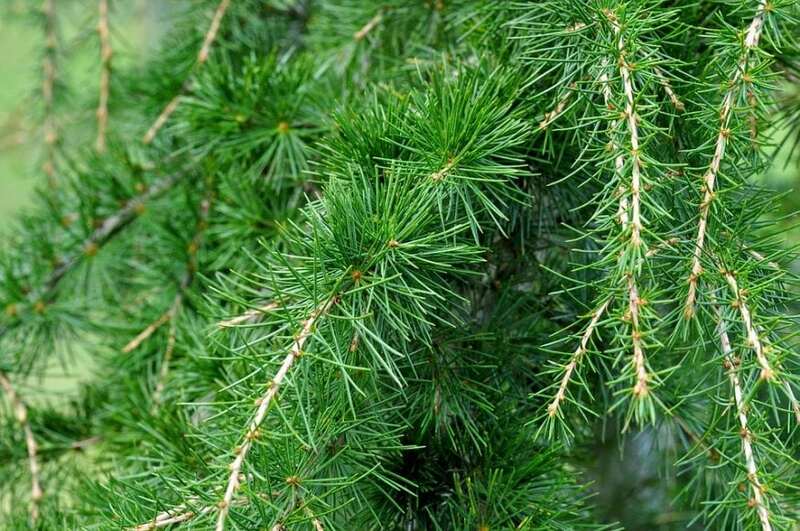 New World Cedars will have these flat leaves and stringy bark that distinguishes them from junipers. In general, junipers can be distinguished by their needle-esque pointy leaves. They may have small blueberries or tiny light brown cones at the tips of the leaves.